Still to turn 20, Anna Karolina Schmiedlova has reached this week her career highest ranking at number 73 in the world, but there is a lot more to expect from the young Slovak. Having been a very successful junior –she reached the final at Roland Garros in 2012- she quickly translated her game to the professional tour with success. Despite being part of the Slovak team for the Fed Cup tie against Germany, she did not have the chance to hit the court there, but nonetheless found the time for a short talk between her team-mates’ matches. 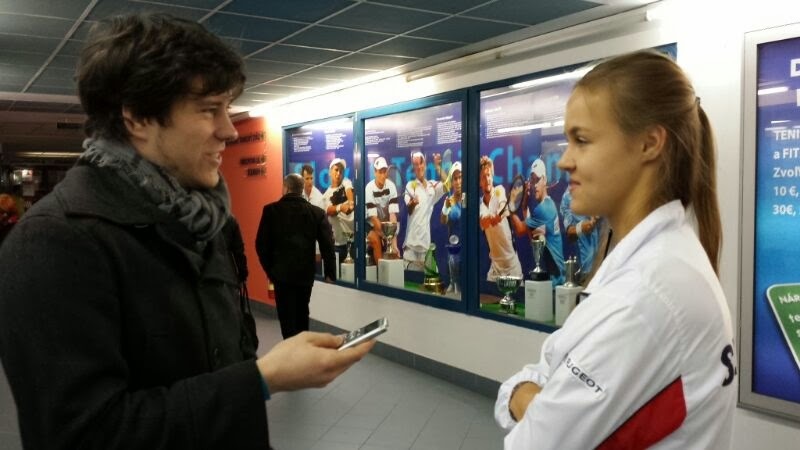 She told me she was very happy about how things are going, but as well recognizes it has been a difficult start of the season, because thanks to her new top 100 status she has played more WTA tournaments, where the level is higher from the very first rounds. “It is different to play WTA: they are very tough and I had to play some very good players, while before I was playing in the ITF’s.” She said. Her next stops are in the Americas as her schedule includes Florianopolis in Brazil and then the big events of Indian Wells and Miami, but before focusing on her future I asked her about her past and which were the matches she was particularly proud of. “Probably last year at the Roland Garros, I beat Yanina Wickmayer and before that match the qualification was really tough too.” She said surprisingly as I expected her to mention her win over Alizé Cornet in Katowice, her first ever WTA main draw match and best win in terms of ranking. As she is ready for many weeks away from Europe shortly after the Australian swing, I ask her how does she feel about all the travelling it is required to be a top tennis player. She still finds a familiar environment when training in the Slovakian capital as with her lives her younger sister, who is also a promising name for the future. There is no doubt that we will hear from her again in the future, because she has everything it takes to keep improving in the years to come.